SORRY, SOLD OUT. 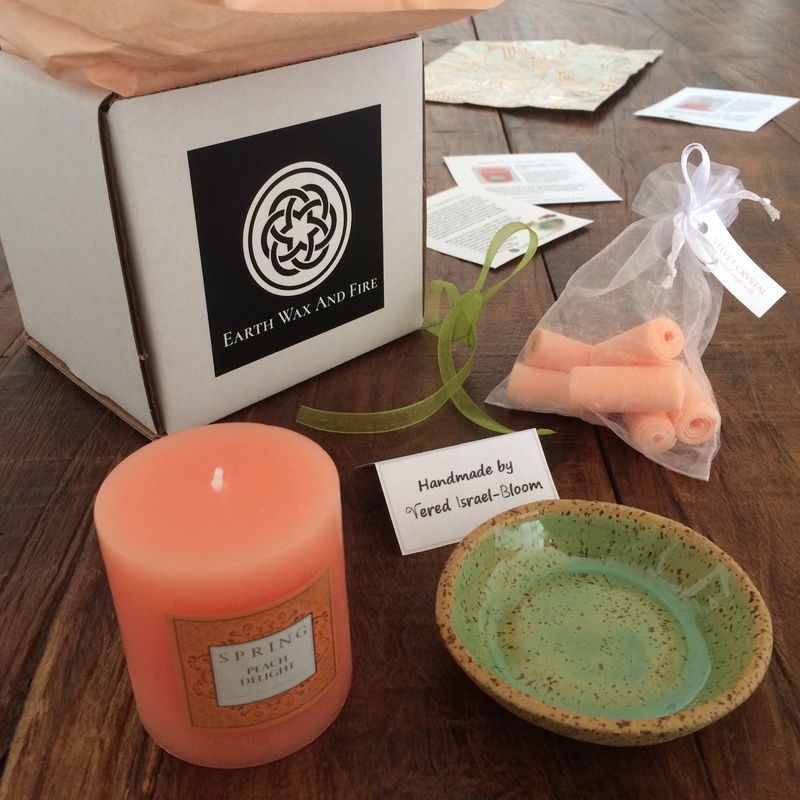 (please contact us at people@earthwaxandfire.com for special orders) ~ ~ ~ ~ ~ Get energized with the refreshing scent of Spring! This combo is sure to delight! ~ ~ ~ ~ ~ SPRING “PEACH DELIGHT” CANDLE: created with a light yet tempting essence of peach, accented with touches of amber, roses, jasmine and French patchouli. The combination creates a delightful and intoxicating scent. Hand-made in Israel by a boutique fragrance shop called Spring Perfume House that specializes in Aromacology, a combination of two words, Aroma and Psychology defined as "the art and science of using fragrances to affect both mood and senses." Burn time is about 40 hours. ~ ~ ~ ~ ~ HANDMADE CERAMIC “GREENERY” BOWL: “Greenery” is a color widely used by trend-setters in the fashion & home decor industry because it was named the 2017 “Color of the Year” by the Pantone Color Institute. Many in the industry feel it’s a refreshing and revitalizing shade that's symbolic of new beginnings. 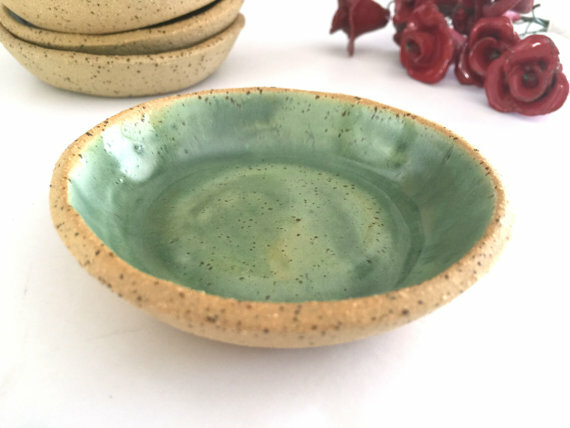 Vered of VIBceramics used a Greenery glaze on this special bowl she hand-shaped from speckled mustard clay. It was hand-signed by the artist and kiln-fired twice at high temperature to become dish-washer safe stoneware. After using your bowl as a candle holder, it can hold your special rings, earrings, and jewelry; hold paperclips & little things in your work area; serve condiments (sauce, catsup, olive oil & balsamic vinegar, butter, honey, jam); hold soy sauce (when serving sushi); keep your daily vitamins; hold spices and potpourri; hold your tea bag; and work as a soap dish. ~ ~ ~ ~ ~ “VELVET CRYSTAL” SOAP ROLLS: specially made to add a fresh scent to cupboards and drawers, these soap rolls are exclusively from the Spring Perfume House of Even Yehuda, Israel. They were handmade by people participating in a vocational program at a local rehabilitative hospital. 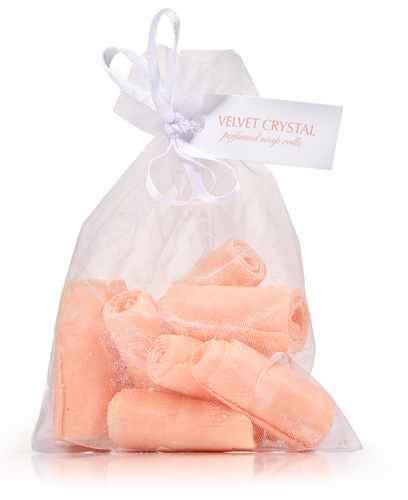 The "Velvet Crystal" scent is a unique combination of two luxurious raw materials - Amber Crystal and ISO-E-SUPER, which, when combined, give a fresh, balanced sensation reminiscent of frankincense, sandalwood, and cedar.